Whenever you are in need of a gutter service here in Austin Texas, you can always rely on Dustin Johnson Exteriors & Roofing as your gutter cleaning, gutter replacement, gutter repair, and gutter maintenance partner. As a premier roofing contractor and home improvement specialist in Travis County, TX, we have been fully immersed in the gutter needs and concerns of the homeowners and business owners in the area. Whenever homeowners like you get tired of risking their lives and limbs to clean, repair, or replace their gutters, Dustin Johnson Exteriors & Roofing is here to the rescue. With over 23 years of experience in the roofing and home improvement industry, we fully recognize the importance of gutters and a fully-functioning gutter protection system to your home or any property. If you don’t have a functioning gutter system right now, you are definitely looking into a plethora of problems concerning your home or building structure. When your gutter is not in good shape, you may expect rainwater to run underneath your roof’s shingles, which can cause severe roof damages. In the same manner, such gutter issue could also affect your home siding as rainwater could easily run down the side of your property, causing moisture accumulation, leak, and even mold infestation. The ones we have mentioned above are some of the many home structural issues that you may encounter if you will neglect to have a gutter installed in your property or disregard maintaining a properly functioning gutter system at home. As we have stated above, in case of gutter issues and concerns, you can rely on Dustin Johnson Exteriors & Roofing to help you resolve your gutter problems. 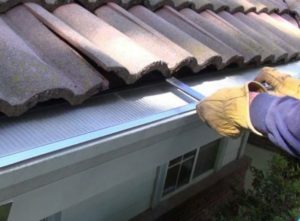 We offer the most reliable gutter products installation, repair, replacement, and maintenance. With our team of experts consisting of professional gutter installers and tenured project managers, your property will always be in good hands. If you are looking for a reliable and trustworthy roofing contractor that specializes in gutters and gutter guard protection system, you should choose the best in the industry, like yours truly, Dustin Johnson Exteriors & Roofing. We have the expertise, experience, and reliable gutter products and materials to provide you not just a fully functioning gutter system but a most of all a peace of mind. Check What They Are Saying Our About Our Services! To know more of our roofing and home improvement services, including gutters, siding, windows, garage doors, and roofing services, you may contact us at (512) 337-2661 or visit our office centrally located at 901 S MoPac, Expy building 1, #300 Austin, TX 78746 for a personal consultation and free estimate. Contact Us Today.